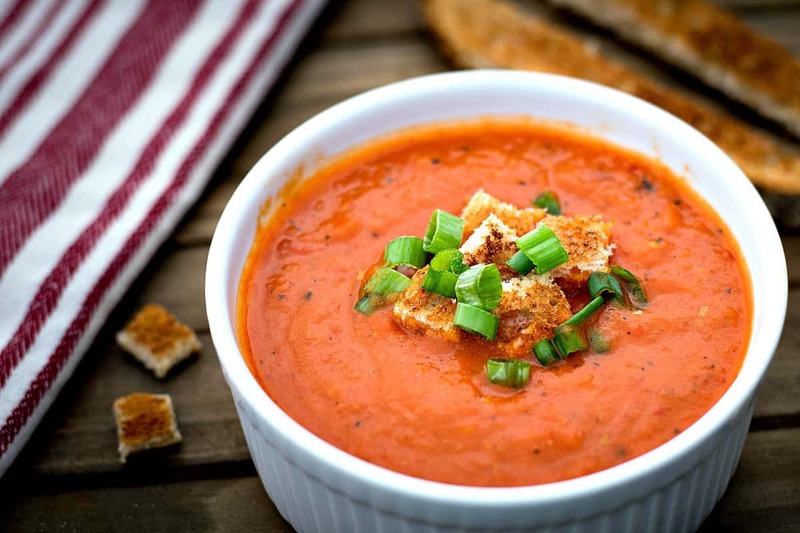 My wife says this Vegan Roasted Bell Pepper Soup reminds her of Panera Bread’s Cream of Tomato – only a million times better! And my daughter said that this is now her new all-time favorite and I better be prepared to make it a lot! Good thing it’s so simple to make! I’ll occasionally buy one of those little jars of Roasted Bell Peppers when I go shopping. You’ll find them next to the pickles, olives, and Italian Pepperoncini Peppers in your grocery store. They’re great to add to hummus or salads, or just anytime you want a little bit of sweet pepper flavor. So last night as I was trying to figure out what to make for dinner ….. Ever do that? Just stand there in front of the pantry or fridge, staring at what you have….hoping something will jump out at you? … I pulled out my jar of Peppers and a can of Fire Roasted Tomatoes and the next thing you know, I had a very tasty soup in my pot – with THE most delicious smells wafting throughout my kitchen. A little onion, a little celery, some garlic of course….. This soup is SO ridiculously simple and easy to make…..but DANG it came out good. Better than any restaurant, I’m not kidding. 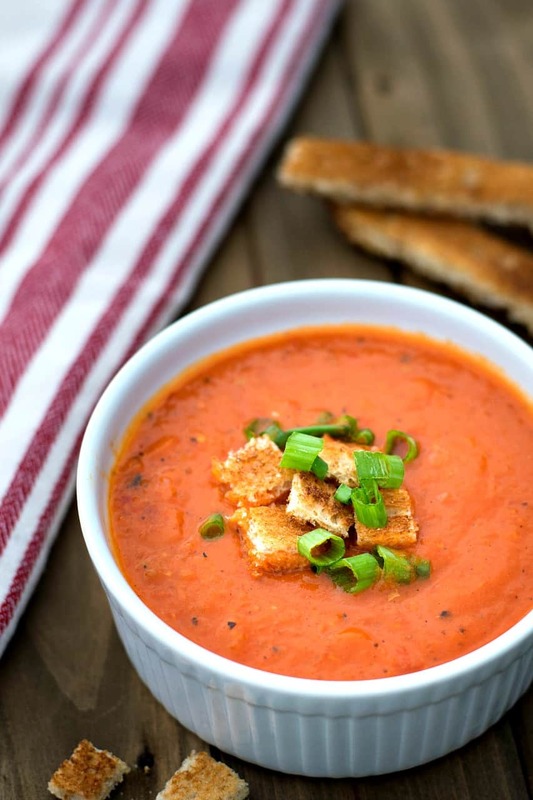 If you’ve never tried Vegan Roasted Bell Pepper Soup – you have to make this at least once. Dice a small onion and 2 ribs of Celery and add them to your favorite soup pot. We’re going to saute them in a few tablespoons of water or broth just until they begin to soften. Add a few cloves of minced garlic and give that a stir. In about 30 seconds or so, add the can of Fire Roasted Tomatoes and your thoroughly rinsed and drained peppers. Finally, add 2 cups of your favorite Low Sodium Veg Broth, a 1 peeled and diced potato, and cover. Any potato will do – I used a Russet but a Yukon Gold would make it even creamier. Bring all that up to a high simmer / low boil and let it cook covered for about 10-15 minutes, or just until that potato is nice and tender. I use an Immersion Blender that I love dearly. I have a few listed on my Amazon Shop Page if you’re interested. They are SO handy! Oh and remember that these are Amazon Affiliate Links, meaning I will make a small percentage if you buy one. Otherwise, you’ll have to carefully transfer this soup to your stand blender and process it until smooth. Please be careful blending hot liquids! Pour your blended soup back into the pot and taste for seasonings. Taste as you go, adding more or less to make it just right for you. Oh one last thing, and this is totally optional but IS really good. Stir in 1 Tbs of your favorite non-dairy Vegan Sour Cream. Bam! Wasn’t that EASY?! And it’s SO GOOD TOO! Very light, very flavorful, and chocked full of healthy Vitamins, Minerals, and Fiber…..just what the plant-based doctor ordered. I garnished my bowl with chopped Green Onions and some homemade toasty croutons. And I HIGHLY recommend cutting your favorite toasted bread into strips for dunkin’. Om…my…..gosh. Hope you enjoy this as much as we did and don’t forget to leave those comments! A rich and flavorful Roasted Bell Pepper Soup that is 100% Vegan, uses NO added oil of any kind, and comes together in just minutes. Perfect for a light and tasty meal. Saute onion & celery in a few tablespoons of water or broth until softened. Add minced garlic and simmer until fragrant - about 30 seconds. Drain & rinse the peppers and add them to the soup. Add broth and the peeled and diced potato. Stir to combine. Cover and bring to a low boil. Cook 15 minutes, covered. Remove lid and check potatoes for doneness. Then carefully blend either using a regular blender or an immersion blender. Garnish with chopped Green Onions, Homemade Croutons, and/or Vegan Sour Cream. Serve with your favorite crusty bread. Just wondering if your jar of peppers is in oil? I’ve been looking for some without oil and haven’t been successful. Oh no! They are packed in water. I bought the Mezzetta brand. Trader Joe’s also has some packed in water! Thanks Chuck, I made this soup tonight. I had all the ingredients. Delicious. I couldn’t bring myself to spending $5.00 for the 16oz jar of roasted red peppers at my local store. So I bought 5 red peppers, roasted them in the oven and followed your recipe. I am pleased with how it turned out! Question….if using my own roasted bells….how many bells? Thanks! I don’t know, I used a 16oz jar. How many are in a jar? 2? 3? I made this for dinner tonight and it was amazing. I left out the cayenne pepper and added some liquid smoke before serving. We served it with vegan grilled cheese sandwiches. Love your recipes and your website. Thank for all you do. Chuck, your wife is right! Although I’ve never eaten at Panera Bread, this soup was amazing! Made it tonight except I could find a 16 oz jar of peppers, so used two-12 ounce jars. I added all the spices, probably 2 pinches of cayenne. We just had an ice storm in Wisconsin, so this really hit the spot tonight! I’m thinking of doing a twist next time: after I blend it, put it back in the pan and add some orzo. Simmer till the orzo is done. Yes? I did subscribe but couldnt open “the five easy steps to becoming vegan”. How do i get it?. this was incredible – i’ve made it in a few variations and we love it! I’m not sure it will change the flavor THAT much….but it will change it some. You really can’t taste it. I love you recipes Chuck! I don’t know what I would do with out you!! Meat and starches) and I gobbled it up. I did probably double the spices. And I added cumin. I put cumin in just about everything!